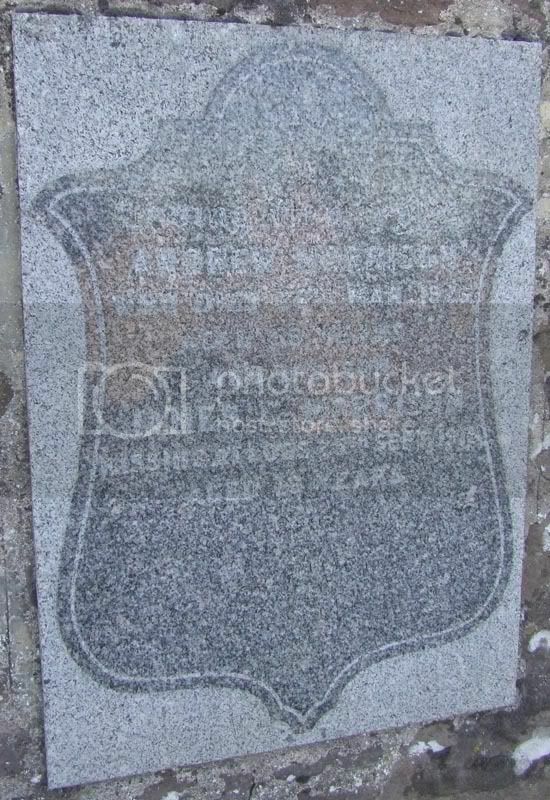 The following are family gravestones. Unit Text: 65th Siege Bty. 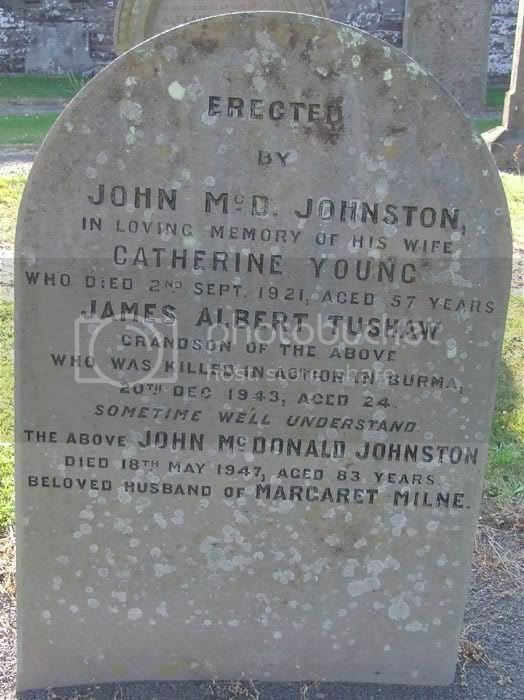 Additional information: Son of John and Thirza Alexander, of Montrose. Grave/Memorial Reference: VII. M. 6A. Unit Text: 4th Field Coy. 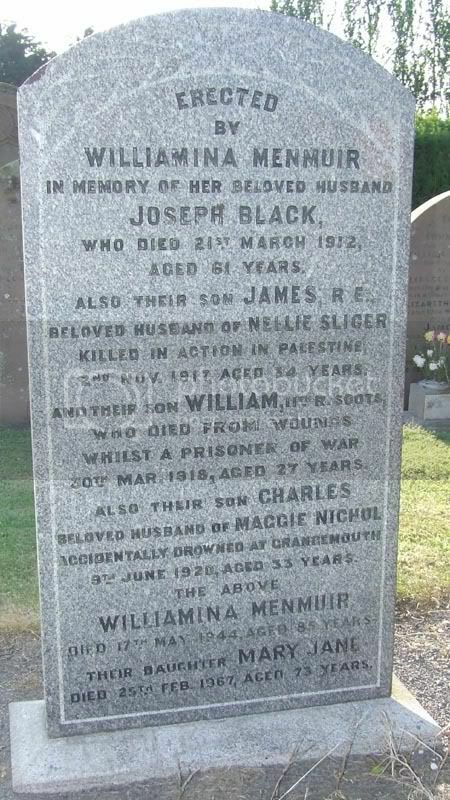 Additional information: Son of the late Joseph Black; husband of Helen Black, of 74, Queen St., Govan, Glasgow. Born at Montrose. Grave/Memorial Reference: XXXI. G. 8. 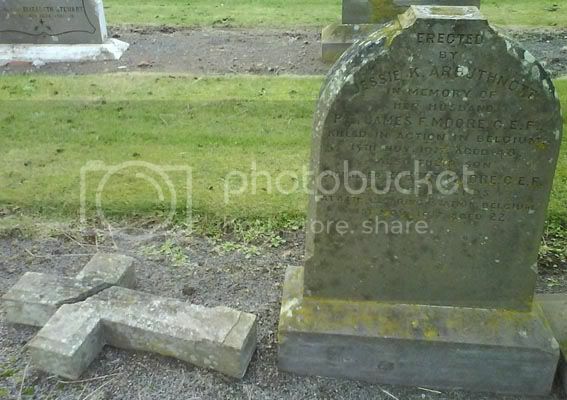 Additional information: Son of Joseph and Williamina Black, of 49, India St., Montrose, Forfarshire. Grave/Memorial Reference: V. A. 22. Unit Text: 9th Bn. attd. 1st/4th Bn. 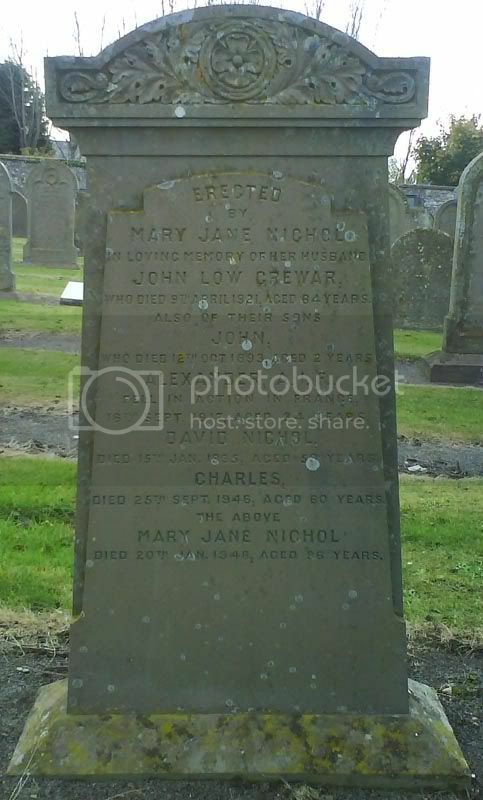 Additional information: Son of John and Helen Thow Clark, of Helen Villa, Bo'ness, West Lothian. Native of Montrose. Secondary Unit Text: attd. 10th Bn. 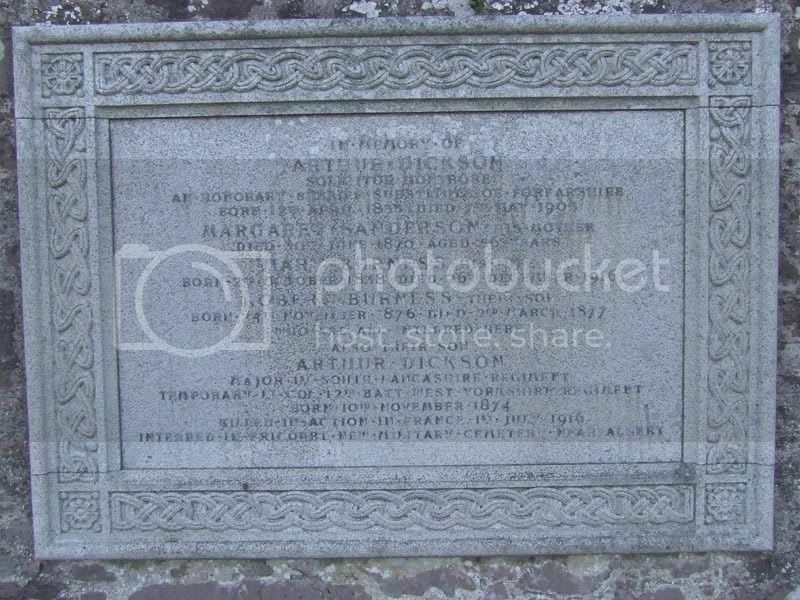 Additional information: Son of Arthur Dickson (solicitor) and Mary Dickson, of Montrose. 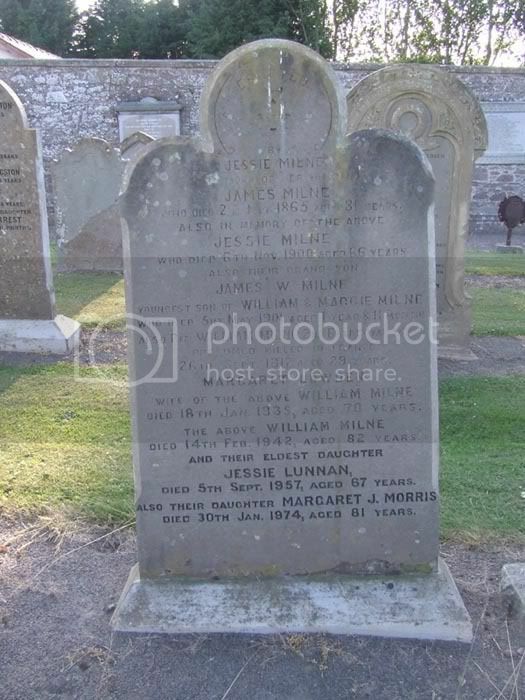 Additional information: Son of James and Williamina Emslie, of 11, Hill Place, Montrose, Forfarshire. 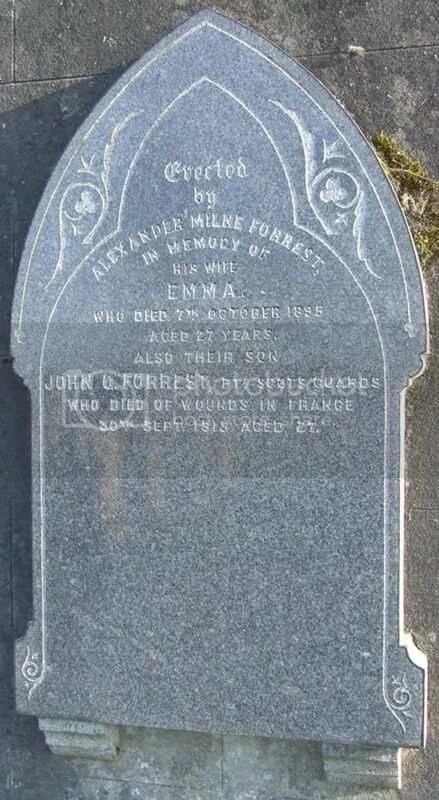 Additional information: Son of Mr. A. M. Forrest, of Beach House, South Beach St., Stornoway. Grave/Memorial Reference: I. D. 28. 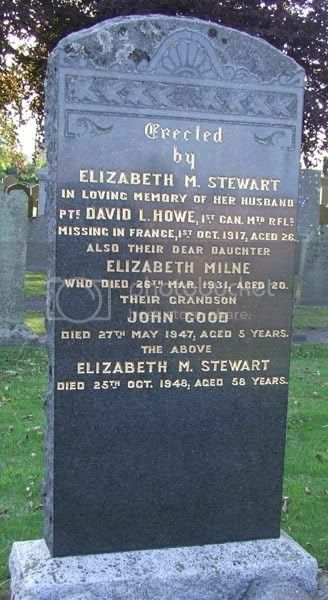 Additional information: Son of John Low Grewar and Mary Grewar, of Broomfield, Montrose, Scotland. 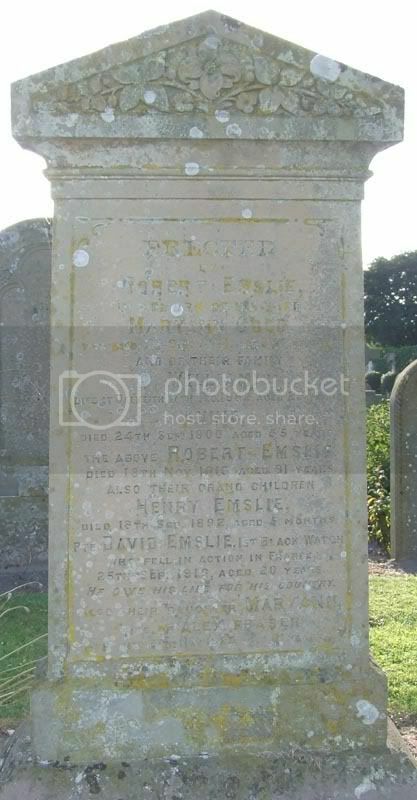 Additional information: Son of James and Mary Howe, of 168, High St., Montrose, Angus; husband of Elizabeth Stewart (formerly Howe), of 35, Union St., Montrose. 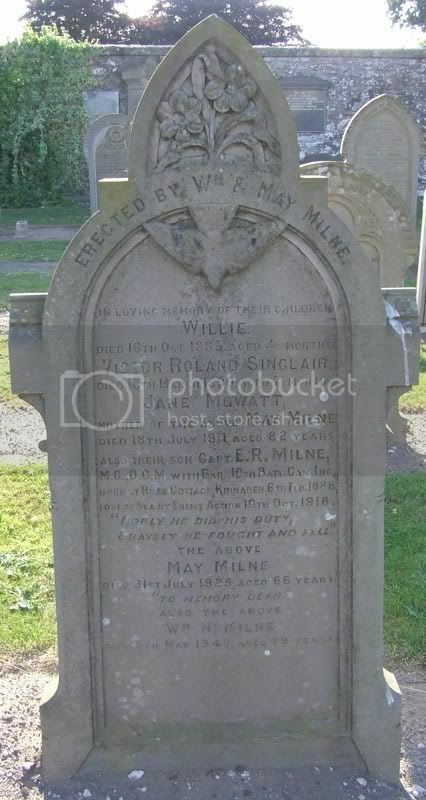 Additional information: Son of James and Jean Laken Guild Kydd, of Letham Mill, St. Vigeans, Arbroath, Scotland. 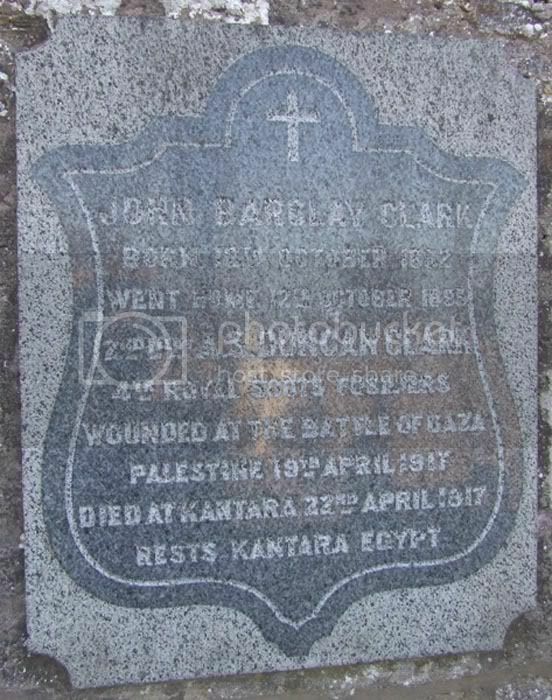 Also served for 8 years in The Scots Guards. Grave/Memorial Reference: II. B. 3. 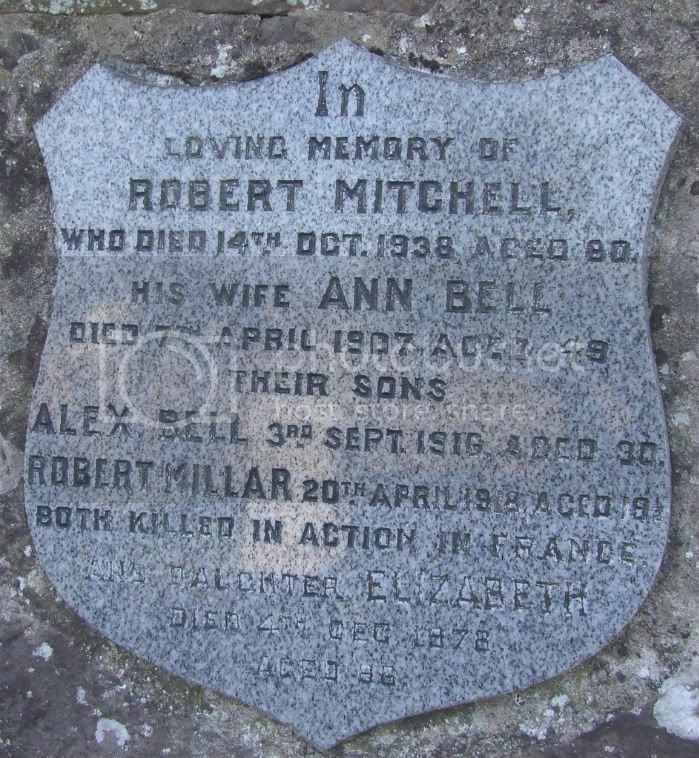 Additional information: Son of William Linton Millar and Janet Millar; husband of Fenella Louise Linton Millar of 4, Sanquhar Rd., Forres, Morayshire. Grave/Memorial Reference: I. F. 4. Grave/Memorial Reference: R.C. H. 4. 32. 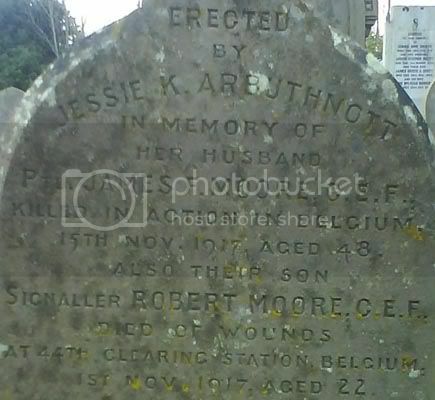 Additional information: Husband of Mrs. G. Harrison (formerly Mitchell), of Powis, Montrose. Grave/Memorial Reference: I. F. 42. Grave/Memorial Reference: Panel 26 - 28. Additional information: Son of James and Jessie Moore, of 513, Spence Street, Winnipeg, Manitoba. Grave/Memorial Reference: VIII. F. 12. Unit Text: "C" Coy. 8th Bn. 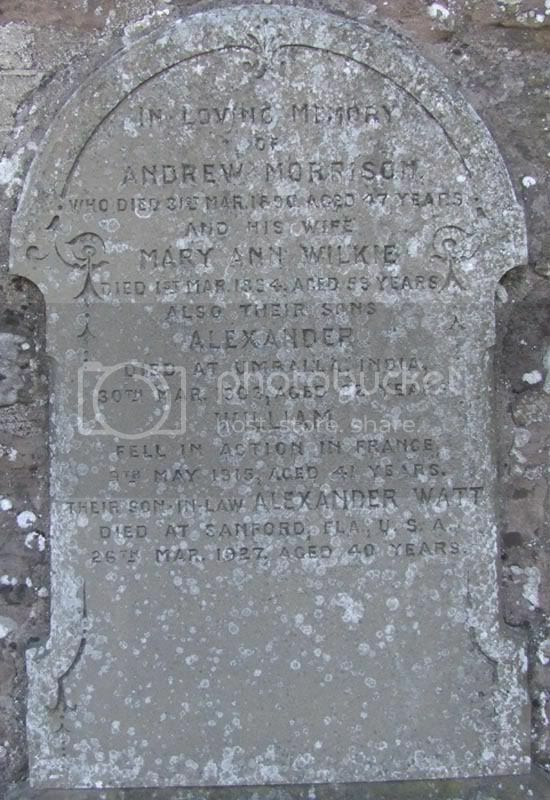 Additional information: Son of Andrew and Ann B. Morrison, of 30, New Wynd, Montrose, Forfarshire. 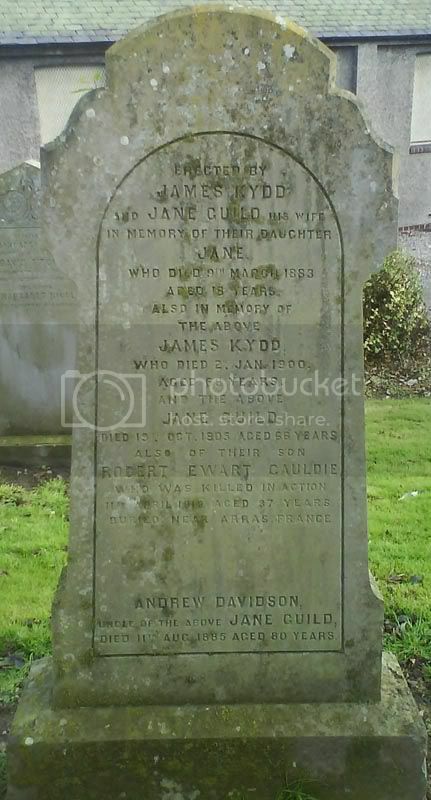 Additional information: Husband of Annie Nicol Morrison, of 25, Dovecot Crescent, Dysart, Fife. 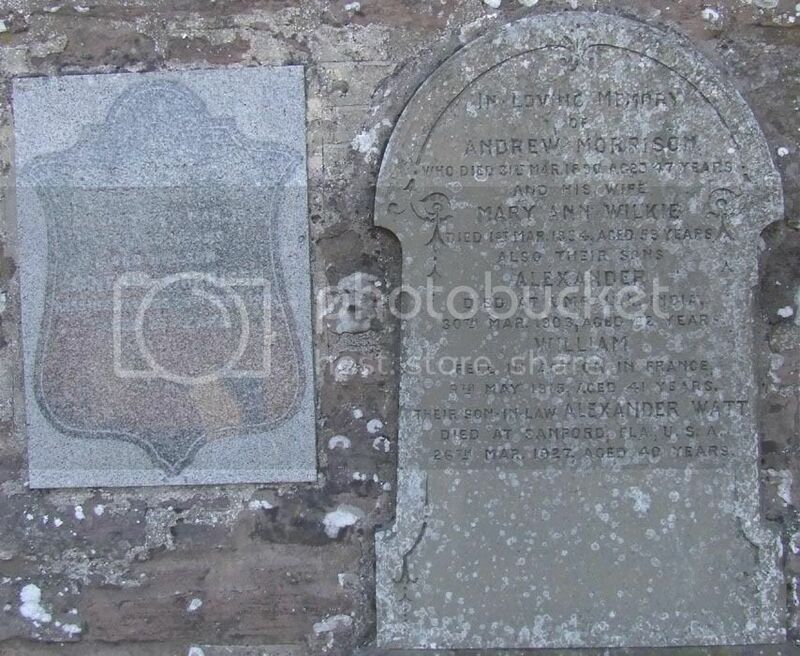 Additional information: Only son of Mr. and Mrs R. Petrie, of 5, Anderson Terrace, Kirriemuir, Forfarshire. Unit Text: 92nd Bty. 17th Bde. 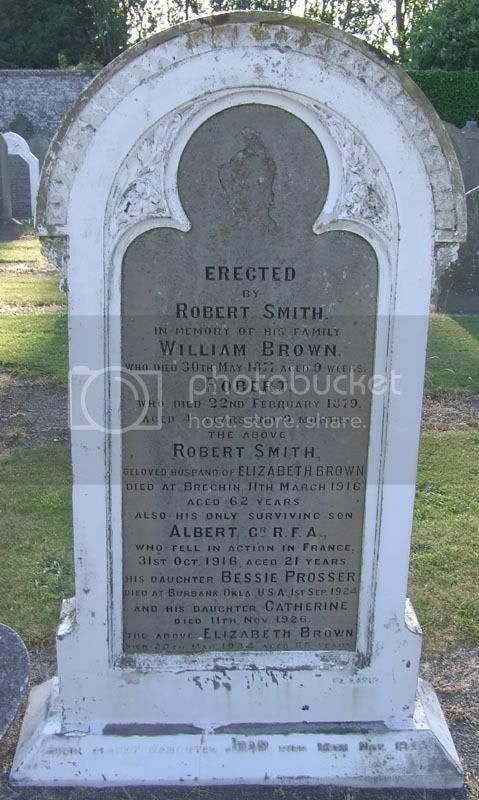 Additional information: Son of Elizabeth Smith, of 3, Bridge St., Brechin, Forfarshire, and the late Robert Smith. Grave/Memorial Reference: VII. H. 13. Unit Text: 301st Siege Bty. 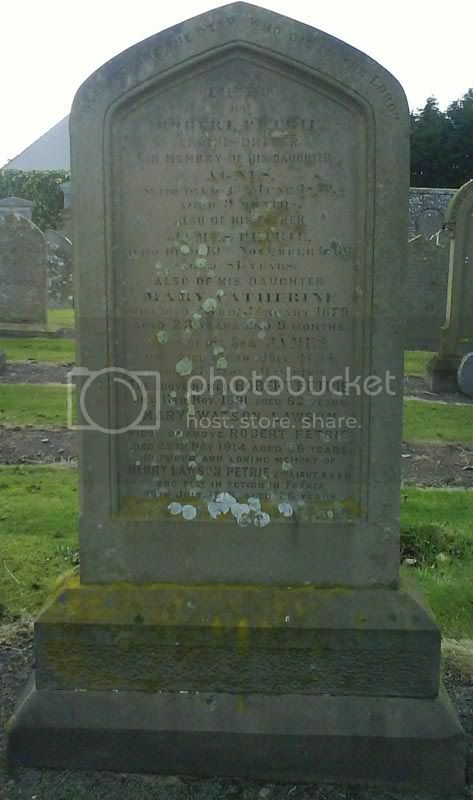 Additional information: Son of Ann High Spence, of 37, Bridge St., Montrose, Forfarshire, and the late John Spence. Grave/Memorial Reference: I. F. 6. 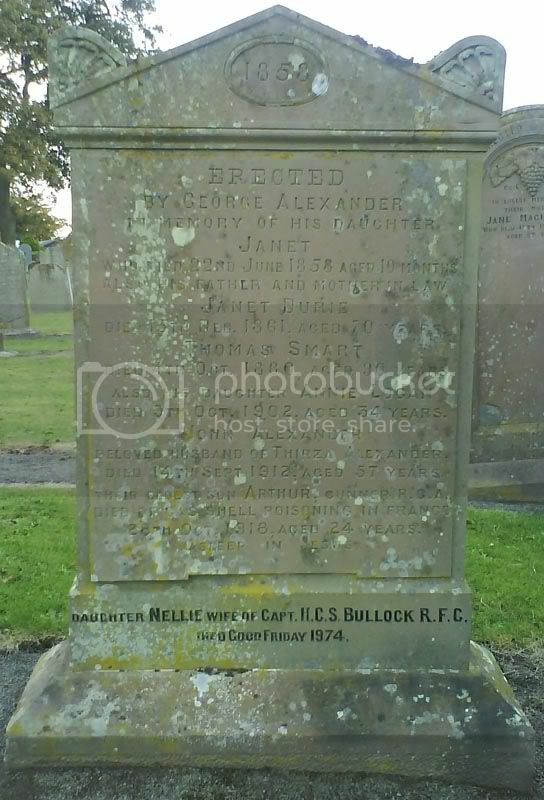 Additional information: Son of Jane Spink, of 53, Dudhope St., Dundee, and the late Alexander Spink. Born at Montrose. Grave/Memorial Reference: IV. A. 6. Grave/Memorial Reference: VI. B. 38. 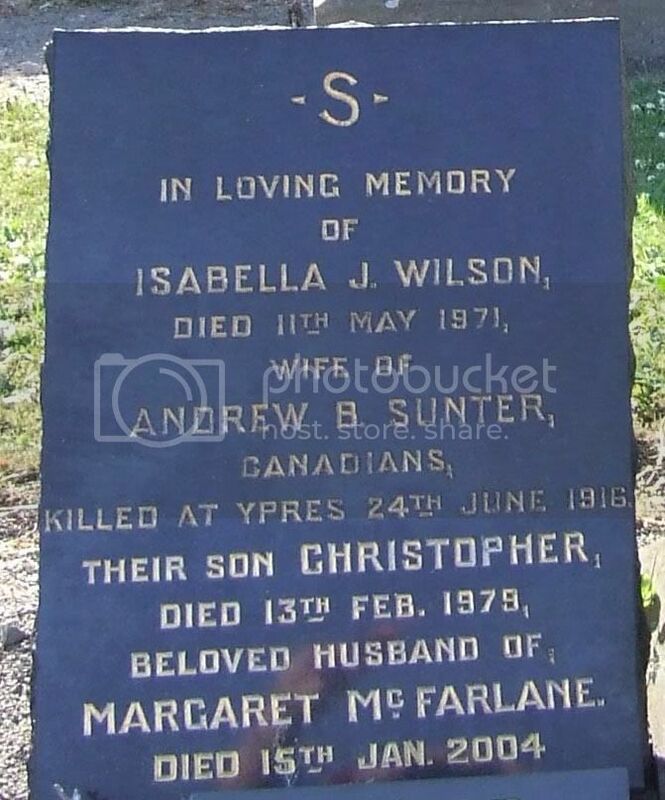 Additional information: Son of Sarah Tawse and the late Serjt. 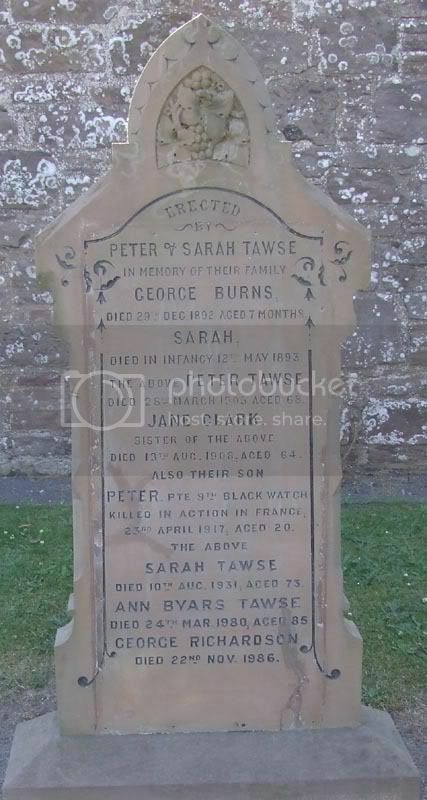 Peter Tawse (Grand Army, U.S.A.), of 12, Bents Rd., Montrose, Forfarshire. Grave/Memorial Reference: IV. E. 25. 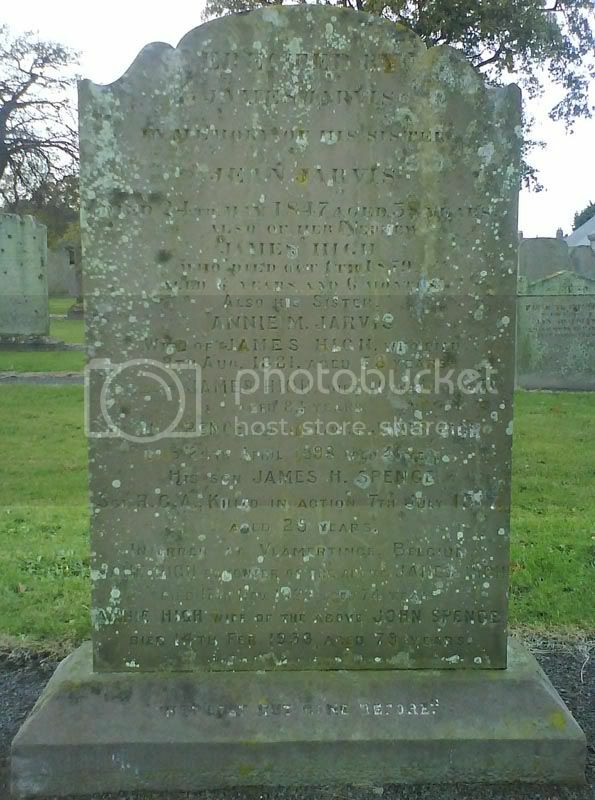 Additional information: Son of James and Annie Tushaw, of Islington, London. Grave/Memorial Reference: 4. C. 16.